Oh boy, do we like spices! We just love them.The smell of the souk in Damascus we’ll never forget; the air pregnant with pungent sweet spicy almost musky aromas that make you dream. Once you put your nose in the typical za’atar from Syria it works as an instant time machine: back in the souk in a minute. It’s because their za’atar is different from most za’atars you’ll find in the Middle East: not only is it a mix of the wild thyme, sumak and sesameseeds they put in a secret mix of cumin and other ‘warm’ spices: this perfume fills the little streets. 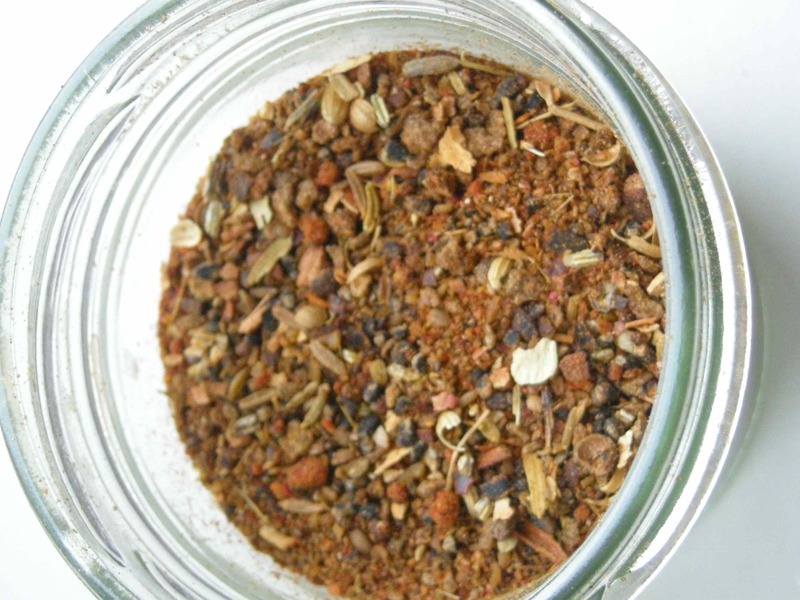 Another favorite spiceblend is the Moroccan one: Ras el Hanout. 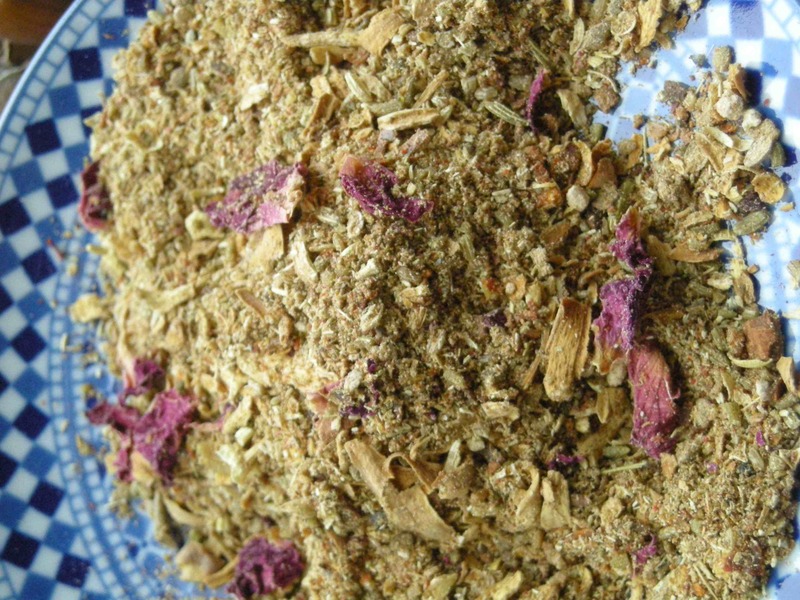 You will find this blend in every Moroccan shop, but doing it yourself at home is ever so rewarding. 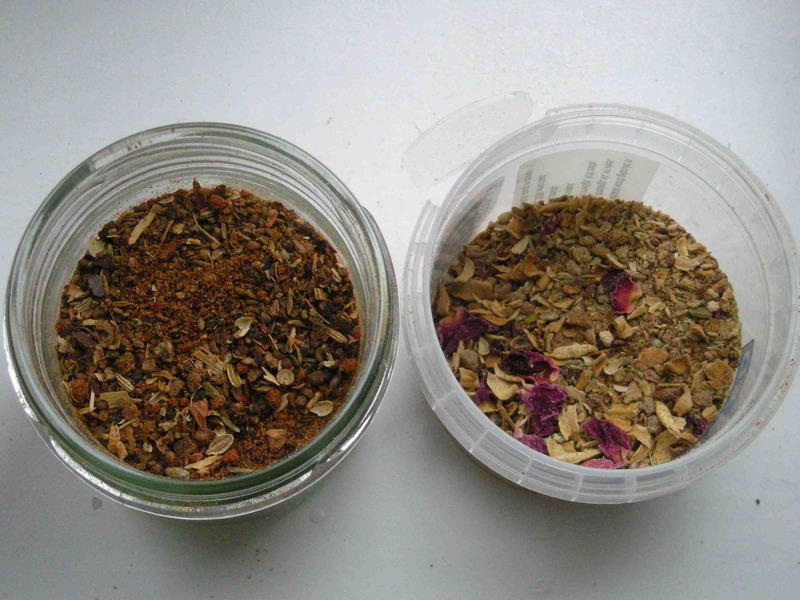 The name says it all: the spiceblend of the shopowner is the translation of Ras el Hanout. So why not take all the freedom we want, in the end this is our shop: so this is how today’s ras el hanout tastes like. Good thing as well as with many things in life: today’s ras el hanout is never the same as tomorrow’s. This time we made a sweet and savory one. The sweet one is full of rose petals, staranise, anise, cinnamon, cardamon, jasmine flowers, fennelseeds. As for quantities, this is just something you need to feel…we are always careful with powerful pungent spices like cardamon or cumin, but it’s just a blend according to your personal private taste, so if you like a certain spice very much, be welcome to add more, just smell and taste with your fingertip if it’s right. The smell is very important. A good starting point is to start with little bits of everything and then add more as you go along. Oh and this time we didn’t have lavender, but that’s very nice to add too. We love to make the chicken stew with this one, and why not use it in spice cookies or even a cake? The savoury one we put in cumin (not too much!) grains of paradise, black cardamon, cinnamon, cloves, different kinds of black pepper, pink pepper, pul biber, long pepper and coriander seeds. Great in a lamb stew with fava beans and quinces! So what do you need? All spices you can find in your larder, a coffee & spice grinder and your nose and tongue!